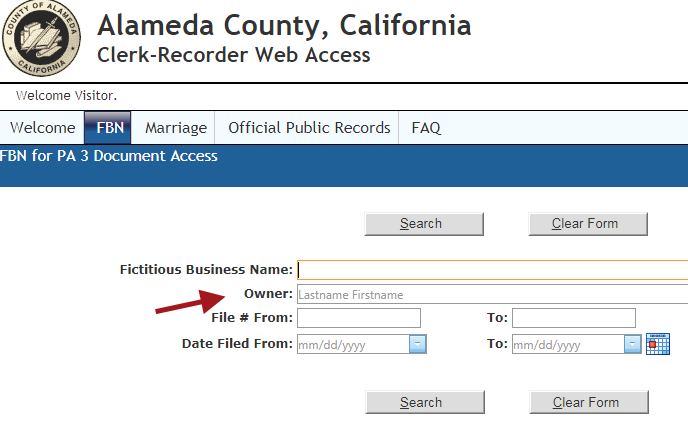 The Alameda County, California Fictitious Business Names (FBN) online database has expanded functionality to include a searchable field for owner name. The FBN index can be searched by registrant name or partial name. Formerly, the only name field was the business name. The results listed the registrant and file number. Now the results return the address, file date and expiration date, and business type (Individual, Corporation, General Partnership, Limited Liability Company). Unfortunately, search by address is not one of the additions. Whatever string of letters you put in the owner name field will be expanded. So, the letters “ARMEN” will return “ARMENTA” among the party names. If you’re not sure of a letter or letters within the name, replace it with the percent symbol. “ARM%N” returns ARMAN, ARMEN, ARMERDING, etc. You can also search by first name when the last name is unknown using a similar approach.”% Casey” in the owner name field returns a list of filings with the first name Casey and various last names, even though the owner field appears to require the order “Lastname Firstname.” Previously you could use this same technique to find a word somewhere in the string in the Fictitious Business Name field, which is still a function. A dropdown menu shows the first entries found, but it’s not necessary to select any of these. The output is a list of records that match the criteria. The forms are not available online. 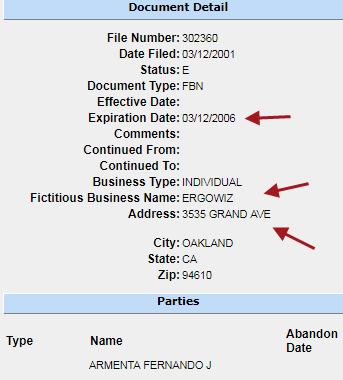 This entry was posted in California, Public Records and tagged Alameda County, FBN. Bookmark the permalink.